Positioning is nothing more than taking a position. A position is many things. It can be a place or location, an arrangement of objects or an arrangement of our body parts in the form of a stance, posture or pose. It can be mental through our point of view and beliefs. And, it can be all of these things at once. So what does positioning mean to each of us in very basic terms within our daily lives? Simply that we all "place" ourselves in the best position we know for optimum success at whatever it is we are attempting. Though we do not normally think in terms of "Now, I am going to position myself to..." this is exactly what we do on an unconscious level. And so it is with the herd management and training of our llamas. Positioning is the underlying key for optimum success in understanding and communication. 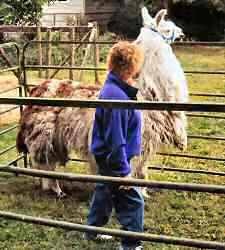 Where we physically stand combined with our mental/emotional stance and body posture can truly make the significant difference in understanding and communicating with our llamas. In turn, our llamas are constantly communicating with us hoping for our understanding by positioning themselves in how and where they might stand in relation to us, each other, their surroundings and in their mental/emotional attitudes and body posture. Without a spoken language, positioning provides the cues for communication. Positioning exists as a constant in both humans and llamas whether we are specifically training, doing routine herd maintenance, crisis intervention, showing or just observing and having fun. And, it exists whether or not we are conscious of it. An awareness of the positioning of other people, animals or the inanimate objects around us is a key part of the positioning equation. 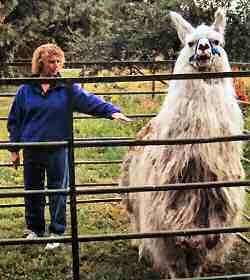 For example, it is obvious when we wish the llamas to leave the barn that we do not stand in the doorway. Not so obvious perhaps, is the position of the door itself. Is it slightly open, wide open… is the wind banging it around? What awareness do we have of our positioning while teaching a llama to jump a low pole? While concentrating on the act itself, we often forget where we are - what is our overall positioning? Holding the lead rope and standing in the middle of the jump on the other side of the pole is not the optimum positioning for success. The llama may feel there is nowhere to jump as we have severely compromised the "landing strip". Yet, I've done it - we've all done it. We must position ourselves out of the way! What about positioning as it relates to the overall health and well being of our llamas? Understanding what might be the more normal positioning for the herd as a group or of a specific llama can serve as a base line for noting when something might be different. One of the more profound uses of positioning is in the catch pen. The fastest way to meet with success in any training lesson is to understand and make use of positioning dynamics. The actual "training lesson" is built upon our use of positioning as a base. A clear example of positioning as a basis for training can be seen when teaching our llama the meaning of the word "stand". If we position ourselves in the optimum place to cause our llama to stand, half the "lesson" has already taken place. Our body posture and mental stance combined with physical location is instrumental in a successful training lesson. Body and mental positioning does well in the form of assertive confidence. Not aggressive dominance nor shrinking violet but a calm, attentive confidence. Stand upright rather than hunched or stretched. Move about in your normal fashion rather than faster or slowly creeping. If you normally move a little faster or a bit slower, do just that. Move as you, yourself, normally do. It is you who they have come to know and as keen observers, they will not miss changes in your behavior. Do any talking in a normal confident tone of voice. Simply, you should behave normally with no added drama either escalated or depressed. Be yourself. Behave as though you know what you are doing. 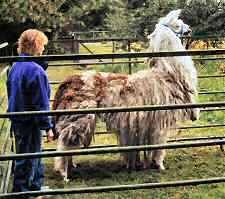 Maintaining these behaviors which are for the most part, our natural selves, is important no matter what the circumstances - from training to accessing and assisting a compromised llama. Physical positioning shares equal importance. As a training example, you have entered the catch pen but not yet begun. Position yourself clearly off to one side so the llama feels he has the opportunity to move about the majority of the pen. In this way, you can do all manner of things before the actual lesson begins without seriously escalating the anxiety level on either side. For a compromised llama, behaving in a more normal, calm and confident manner will help to mitigate the effects of an already stressful situation. 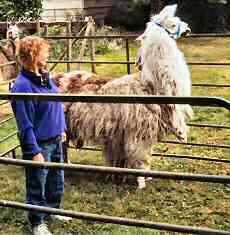 While teaching one of my two-day llama behavior and training clinics at Glenn and Cyndy Baker's Critter Creek Ranch in Port Townsend, WA quite a few Decembers ago, I clearly discovered the profound use of positioning. Though positioning had always been there, I had no specific awareness of it. It was a discovery - a newfound awareness - that would greatly clarify and simplify training and herd management no matter your preferred method or technique. We were working on catching and haltering and I was puzzled. How was it that one participant could maneuver the llama easily about the pen in any direction and others simply could not do it? This puzzling "phenomena" was a common occurrence at every single clinic I had ever attended, assisted with or taught. What was one participant doing differently than the other? There had to be something I was missing. What was it? Was it their particular demeanor? Was it a particular llama? Though those things obviously came into play within the total picture, they were only a part of the whole. It was a great puzzle to me and I finally stopped the clinic asking participants for any observations or thoughts. We had a great discussion but the answer wasn't immediately clear to any of us. I was absolutely intent to discover the reason. A great deal of clinic time was passing so I decided to take a vote of the participants as to whether we should continue to solve this puzzle or go on to the next area of leading exercises. The vote was unanimous - solve this mystery! Everyone wanted to know how to control the action in the catch pen and those who could already control it were most curious to understand why. We spent most of an entire day in and out of the catch pen with a number of different animals and participants... same person, different animals... same animal, different people. We observed and discussed and replayed again and again. 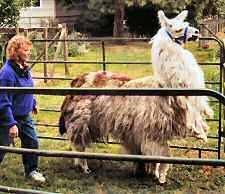 We soon discovered many subtle positioning quirks such as differences in the depth of personal space for individual llamas as well as for each participant, how the size of both the person and the llama played a role and the importance of paying attention to balance. 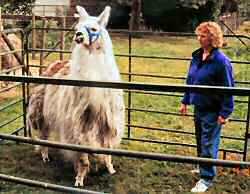 The direction we faced in relationship to the llama often had a profound impact on the success of directional movement. We discovered our mental and emotional stance was part of the overall equation. The most profound overall discovery, however, was where to position oneself to make certain things occur in the catch pen without exception in nearly every instance. Though I did not realize the immense scope of our work at the time, specific attention to the art of positioning was a key element for optimum success for all training and herd management. It would profoundly enhance my ability to teach by immediately providing participants with a much more clear and visible understanding of human/llama interaction. The success of positioning is immediate. Our ability to apply any training method/technique or herd management skill comes much more easily and quickly if we first position ourselves for success. Though we had long missed them, there are three obvious primary positions to keep in mind - forward movement, standing in balance and turning. A fourth, the stopping point, is a brief position that cannot be maintained for long. To move your llama forward, move to their rear and stand diagonally out from the hip. To have your llama stop, move forward to that small space between the withers and the eye. This position halts the action for a brief moment. As your llama stops, immediately drop back a step or two to position yourself just behind the withers. If you should remain in the "stop" position for too long, the llama will become uneasy and move. By immediately stepping back a few steps the moment the llama stops, both you and your llama should find yourselves in balance and standing in place until you give the next "signal". To have your llama turn in the opposite direction, move to the front just beyond the eye. In positioning as in all things, it is key to be mindful of balance - both yours and that of your llama. As a side note, if you are using positioning in a catch pen to get your llama to stand for haltering and your llama does not move, do not insist that they do. In this instance, the whole point of positioning is to understand how to communicate to get the desired results. If he is already standing then you have the result you were seeking. It is amazing how quickly llamas understand positioning. For some it will take a couple of times of maneuvering about the pen while others will immediately understand your communication. And, as we become more skilled with positioning, our communication becomes much more clear. In positioning one’s self for moving forward and/or stop and standing, your body position should be such that you are facing in the same direction as your llama - your noses should be pointed in the same direction. For turning, you must adjust your body position to face the llama. Interestingly, once again your nose will be pointing in the direction you wish your llama's nose to head in order to make the turn. We all tend to move in the direction our nose is headed. Again, watch the balance. When you and your llama are first experiencing positioning, it is important for you, yourself, to consistently face in the direction you wish your llama to go. Llamas are keen observers of body language. Our work that day experimented with facing towards our llama and facing the same direction as our llama. We discovered when facing towards our llama, particularly when initially learning the nuances of positioning, we often created the effect of blocking, cornering or trapping our llama. Facing our llama created closed shoulders and the ability to outstretch our arms along our llama's body length. This is a common stance by humans for "cornering" or "catching". Facing the same direction as our llama opened our shoulders and greatly lessened the usefulness of our arms reach providing a more obvious and clear "escape route". This same direction positioning facilitates the opportunity for feeling a higher level of security, safety, attention and communication for both human and llama. Thus, applying the notion we are giving signals by our body language, by our turning and facing our llama when asking our llama to turn, we have basically created a physical block as well as the image or idea of what we want to have happen. We are, in effect, giving signals - communicating - with our overall body positioning. And llamas, as we have noted, are keen observers in this area. When using positioning it is important to keep the personal space zone in mind. 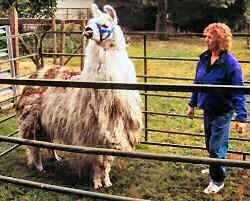 This zone is not a matter of inches or feet and varies from llama to llama as well as from person to person. Do not crowd nor stand far away. I've found the most consistent distance is an arm's length plus about one hand more. And, believe it or not, it is your particular arm's length not anyone else's. The distance is relative to our own unique size. In solving the mystery, we discovered a shorter person's (like myself) arm length distance was actually crowding for a tall person. I truly thank those many who were in attendance at my clinic that day for their help, support and enthusiasm in providing the opportunity to solve this long-standing mystery. We are all much better for the experience and I could not have solved this mystery without their willing participation and thoughtful input. As a result of this collective effort, I have been able to add the valuable art of positioning to my understanding of llama behavior within my own herd and share it with others in my behavior and training clinics. The increased success for participants, not to mention myself, is truly noteworthy.